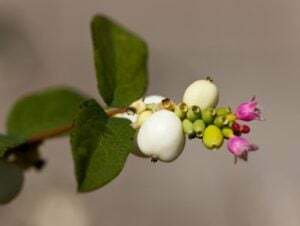 Coralberry (Symphoricarpos orbiculatus) is a member of the Snowberry family. They are grown as a shrub that is sometimes considered to be a ground covering plant. They are a tolerant flower that grows outside during the cold winter months. They are very tough plants that can hang in there through the cold. This shrubs leaves are an oval shape that are very dark green in color. During the spring this plant grows very small bell shaped flowers. They are typically white flowers that sometimes have a hint of pink on them. In the winter, this plant grows tiny clusters of berries on it. The fruits are a very deep shade of purplish red. While some wild animals may eat these berries, they are poisonous to humans. So if you are growing this plant in your yard, don’t sample the berries. They will make you sick.